Andrew Holmquist. “Swim Meet,” 2015. Oil, acrylic and spray paint on canvas, 84 x 72 inches. Painter’s painter and local art darling Andrew Holmquist’s jazzy collection of new work is a sight for sore eyes during this most dreary time of year. The installation is packed with paintings and sculpture, topped off with a video in the back and a bizarre, latex-clad figure in the storefront window. Holmquist’s style has always been on trend, but one element that brings this collection out of that realm is the subtle nod to the human body, which provides a reference point for the artist as he composes the paintings. A hand here, a foot there and voila! You’ve got a mass in space, not just a bunch of paint. If a distinct body part isn’t visible, it’s implied through the gesture of a figure, with paint strokes mimicking the movement of sweeping limbs and twisting torsos. But they’re more character studies than portraits—a room full of wild and crazy guys. Holmquist’s work was once more overtly figurative and later more abstract, but the cleverly proportioned combination of the two at this point in his practice serves him well. His confidence shows in the bold moves and voluptuous shapes. However, the palette seems less sophisticated, with simplistic color choices that occasionally cross into Trapper Keeper territory, but are still undeniably appealing. 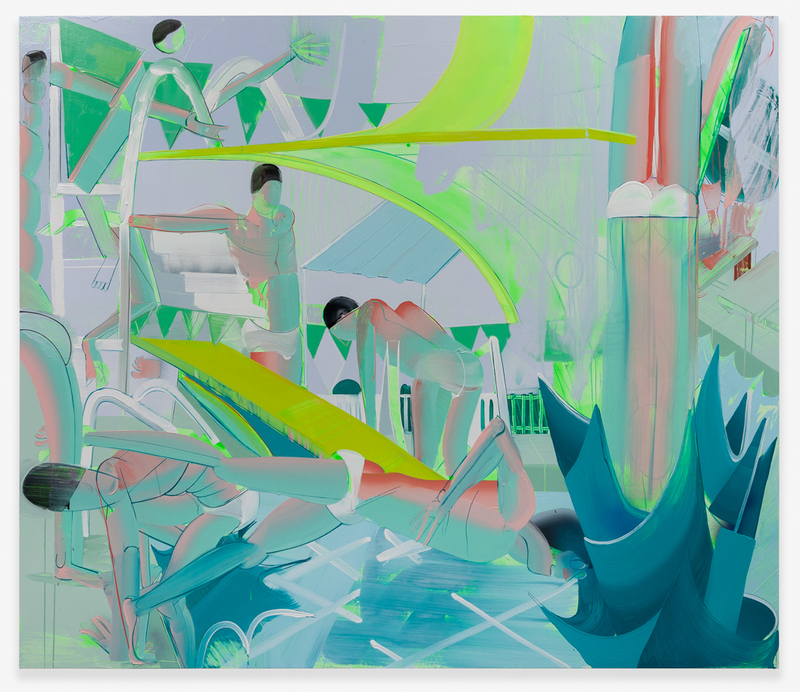 “Swim Meet” and “Locker Room,” the largest and most prominent paintings in the exhibition, are more poised, seducing with peppy pastels, tropical hues and pops of neon chartreuse. Atop a cluster of pedestals sits a cleverly unrefined cast of characters formed from ceramic, bodies fused with abstracted forms. Against the back wall, a video plays with a vintage aesthetic like something Matisse might have made. Colored lights glow behind paper cut-outs, creating oblong shapes which blink sporadically, permeated by the silhouettes of arms reaching through the holes, wagging around like elephant trunks. Through March 12 at Carrie Secrist Gallery, 835 West Washington.